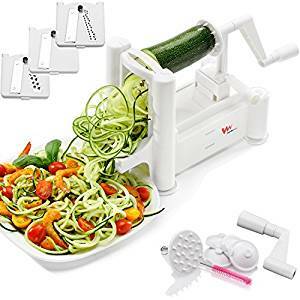 Best vegetable spiralizer or slicer can help you to shred vegetables into slices to prepare meals that are focused towards no carb vegetable diet such as Atkins or Paleo Diets. It is best to have spiralizer that would not jam or break when applied a bit extra force. Moreover, it is good to have as many option for the types of the blades and nice sharp blades to cut the harder vegetables. 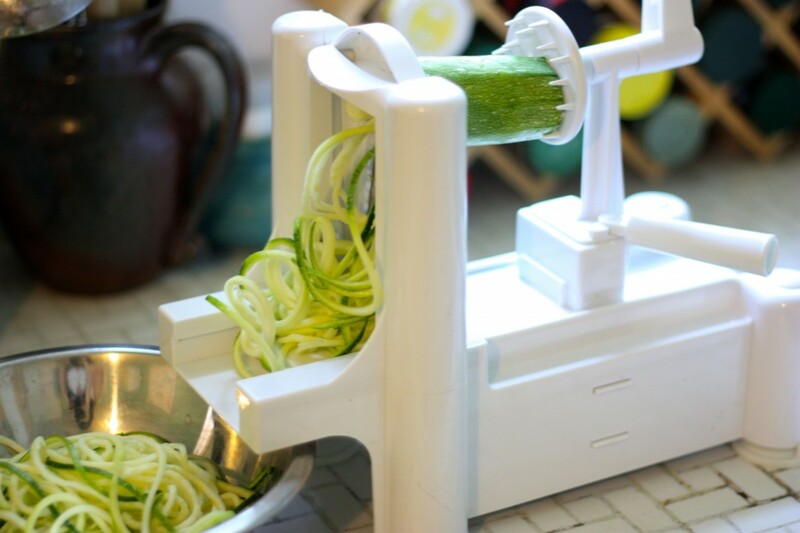 Another best vegetable spiralizer is Benriner Turner Slicer. It is made in Japan and as you know Japanese technology is recognized as highest quality therefore you can count on this machine for epxert craftsmanship. There are 4 different blades in it including fine blade, medium blade, turning blade and a course blade. Changing the blades is quite easier and you can do it with just a flick of a switch. As compared to Paderno Sprializer, its blades are dull and lack variety of shapes. But the difference isn’t significant therefore it can also be considered as an option for those who need something different. What actually makes Benriner different and top of the line is its overall design. The ease of use with this kitchen gadgets is another factor to make it a choice. You only need to pour in your vegetables in the machine and turn the handle. This gadget is sleeker and turning its handle is effortless and seamless. It gives you professional looking slices without broken pieces. Machine itself is slightly ugly, but its finished product is better. The build is better and its blades are rigged on firmly. It is pretty hard to break and therefore we can say its plastic isn’t cheap. Cleaning its blades as well as machine is simple enough that you can remove its blades by just loosening the screw. Overall, Benriner is one of the best sprialzier which is easy to use and durable. 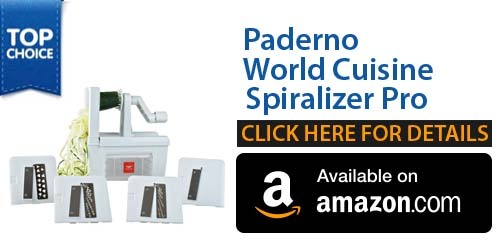 To have the best spiralizer, go for Paderno World Cuisine Sprializer Pro, which is the best vegetable spiralizer on the market today. It is a brand that best revolutionized its gadgets. It comes with various great features such as it has world class build made up of stainless steel blades and best abs plastics. When you use it for the first time you will immediately recognized its expensive materials. It comes with lifetime warranty to justify that company is completely behind its quality products. There are 4 different types of blades to choose from and every single is useful and unique as well. These blades are well made and sharp enough to cut the hard vegetables. One blade is for fine shredding to create medium sized vegetable slices. Then there is a chipping blade to make thicker cuts. The straight/accordion blade creates ribbon type cuts to cut cabbage that are used in coleslaw. The last one is a newer blade called Angel Hair Shredder that create hair sized vegetable pieces. Paderno is very easy to assemble and use as well. It works out of the box and doesn’t need any electricity. It is made to be compact that comes in box for easy storage. There are also rubber suction feet to help it stay well in place. There are also little compartments for different types of blades. In order to assemble it, you need to remove the hood and insert pads in the place upright. 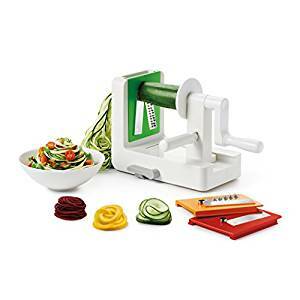 For using this spiralizer, you just need to insert your desired blade in machine and pour in your favorite vegetable between 2 pads and move the handle. Finished spiral pieces will come out from the other end that can be collected in a bowl. 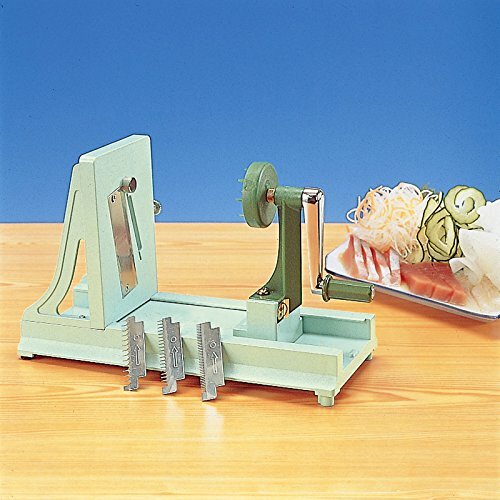 Cleaning this vegetable slicer is also very easy because the leftover do not get jammed or clogged in the blades and fall out very easily. 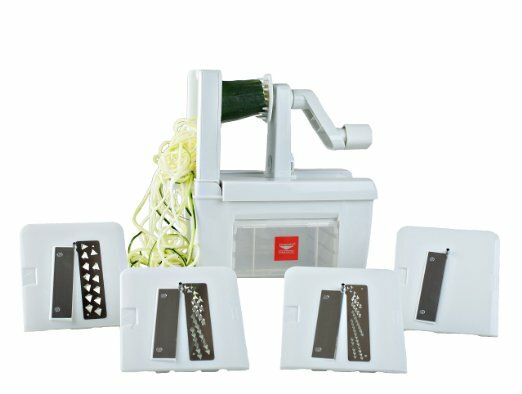 Paderno is really the best vegetable slicer or spiralizer for those who want best quality in terms of durability, ease of use and cleaning and versatility. It is an essential thing for serious chef. 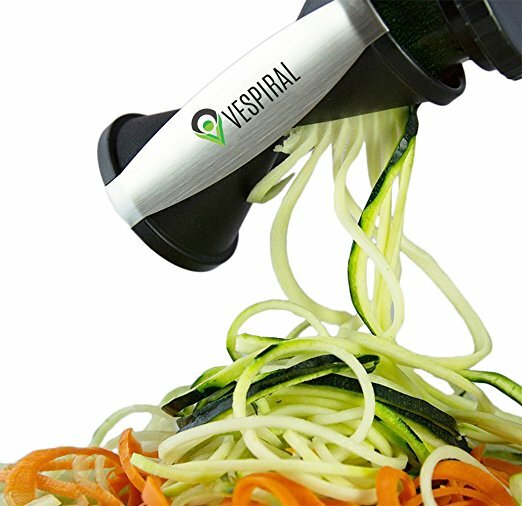 It you want the best spiralizer that is also portable, then Vespiral Nano Blade is the one. It is made very simple and has only 3 parts. One of the appealing point for having this spiral slicer is that it is compact and portable, therefor you can take it with you anywhere. Operating its gadget is also simple and easy, just insert the ends of vegetables in it and turn yourself manually. No need to use much pressure as blades are sharp enough to shred even harder vegetables like radish and carrot. The best part there isn’t any worries about accidentally hooking the hands in blades. There are safeguards on it that prevent from this event. You get two blades option with it, wide and small to help you adjust the spiralizer. Although it is better to have more options for blades. Although it isn’t as fast as Benriner and Paderno, the sharp blades is quick enough to help you out. It can be washed in dishwater if you are a lazier person. Though it is difficult to break it, the company still gives life time guarantee for breakage. We think this machine is nice and handy to have it in you kitchen and it really comes at reasonable price. The only low light about it is that it can only produce 2 types of spirals therefore for more options you have to look for the above brands. 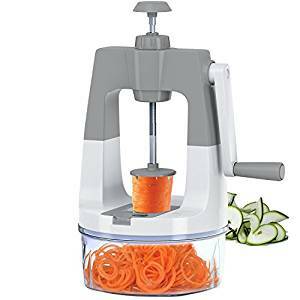 However Vespiral Nano Blade Spiralizer is best for those who are looking for a cheap and compact device. If you like to eat and let your family eat more veggies and liver better health, get this vegetable spiralizer. You can consider it to be the market leader. This product is a superior at the lowest possible price. It is strongest and heavy duty (30 to 35 percent stronger than previous models). Still you will get a lifetime hassle free replacement warranty from manufacturer. It perfectly shred, slices and chips most fruits and vegetables. There are many long spikes to hold vegetables. It work great for wide and long veggies, up to 7 inch wide and 10 inch long, without cutting them manually into small pieces. Easy self-contained storage for 3 Japanese 420 high carbon cutlery grade stainless steel blades makes it easier to deal with hard veggies. 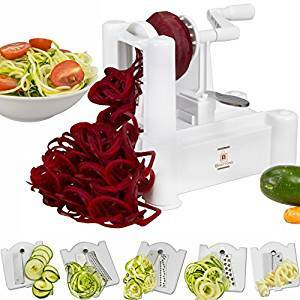 Manufactured from top notch, 100 percent food safe, BPA free, durable reinforced Plastic (ABS) to enable it to handle harder root veggies such as turnips, sweet potatoes that previously broke handles of the spiralizer. No need of electric, so it is ideal for camping and emergencies. Easy to clean and operate and dish washer safe. 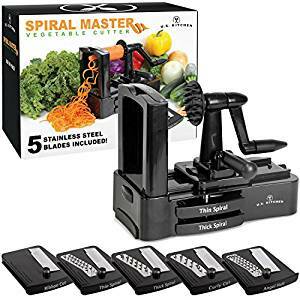 Be it preparing salads, or making raw vegetable pasta or garnishing to create a gourmet masterpiece dinner plate, you can do anything with this Spiralizer Elite Spiral Slicer. So don’t get bored, because when you get it you can immediately start making Low carb, raw, paleo, gluten free, and vegan diet. It comes with a free recipe book filled with nutritious and mouthwatering ideas for healthy family meals. 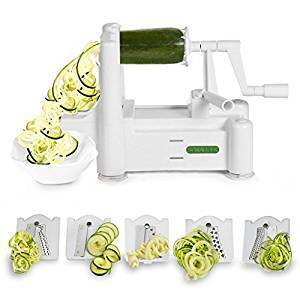 This spiralizer is featured in Bethenny, The Doctors, Ellen, Food Networks, and other national newspapers as well as magazine across the country. 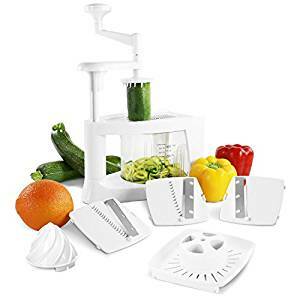 Don’t fill your drawers and cabinets with heavy kitchen tools when you can have Simple Chef 4 Blade 8 in 1 spiralizer that fits everything you need from juicer to mandolin and from slicer to grater. Its easy to use vertical handles allow you to spiralize even hard root vegetable like turnip and sweet potatoes without any sliding and slipping. It includes suction cup feet which secure that this tool will going to stay steady on your counter top and can do any job. Its 4 cups container is marked with simple and accurate measurements, therefore you can make right amount all the time. This is the best dishwasher safe unit. When you are done, just hand wash it or toss it on dishwasher and dip dry. All attachment are on unit therefore you don’t need any extra space in your cabinet or bother for lost attachments. This unit is breeze to take apart therefore you gets really clean all the time. It is easier to use to prepare any low carb, gluten free, raw and paleo diet and replace them with those high carb meals like French fries and pasta. So pick to have uniform vegetable noodles all the time. It comes with 30 days satisfaction guarantee, i.e. if you aren’t satisfied with it just return it against full refund.